Written by Philip S. McMullan, Jr. Many theories and myths have been put forward to explain the Lost Colony. They were thought lost at sea, washed away by a hurricane, moved southwest to become Lumbee Indians, killed by Powhatan in Chesapeake, or captured by the Mandoag in Chowanoke. None of these theories stand up to all of the available evidence. In his 1985 book, Set Fair for Roanoke, David Beers Quinn gave a very comprehensive review of all that was then published about the Roanoke Voyages. With the statement below, Quinn set the challenge for this paper. “How did these people, over a hundred of them. ... survive or die? Surely they died, as they had begun to live, inside what is now North Carolina. Had they not, as seems most probable, somehow dispersed themselves among the Indian population? If this was so, did they leave traces that survive, hidden in the swamps and fields and even in the ancestry of the people of North Carolina today?" I was employed by Prulean Farms, Inc. and the Research Triangle Institute in 1982 to assist the U.S. Corps of Engineers with the preparation of an Environmental Impact Statement (EIS) for a proposed 22,000-acre farm on the mainland of Dare County. One of my duties was to prepare a history of development for the Dare mainland and its surrounding region. 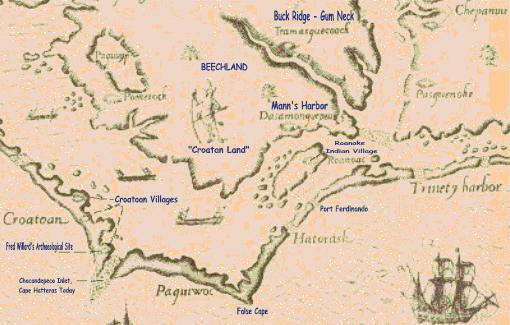 During the preparation of that history, I became aware of a settlement on the Dare mainland called Beechland. A number of Dare natives have claimed that their ancestors lived undiscovered in Beechland for hundreds of years before it was abandoned in 1840 because of a “black tongue” plague. Family legends claimed that these settlers were the descendents of Indians and of English men and woman who they believed were from the Lost Colony. I examined historical documents, such as John White’s papers, and the available physical evidence to determine if the legend satisfied the available documents' evidence. My examination is the subject of this paper. Although the evidence is far from conclusive that Lost Colonists reached Beechland, I believe it is sufficiently persuasive to justify a thorough archaeological search there and in the other likely Croatoan villages around the Alligator River. What Were the Colonists' Intentions? Where Were the Croatans in 1587? Why Did the Colony Relocate? Is There Other Evidence of Settlement at Beechland? Why Did They Remain Hidden? “... as we entred up the sandy banke upon a tree, in the very browe thereof were curiously carved these faire Romane letters CRO: which letters presently we knew to signifie the place, where I should find the planters seated, according to a secret token agreed upon betweene them & me at my last departure from them, which was, that in any wayes they should not faile to write or carve on the trees or posts of the dores the name of the place where they should be seated; for at my comming away they were prepared to remove from Roanoak 50 miles into the maine. Therefore at my departure from them in Anno 1587 I willed them, that if they should happen to be distressed in any of those places, that then they should carve over the letters or name, a Cros X in this forme1, but we found no such signe of distresse. 1 For Windows 98, this cross shape may not be supported. For all other versions, the shape should display properly. After this short visit to Roanoke Island, White set sail for Croatoan Island (fig. 1) where he expected to find at least some of his colony. Seven sailors had drowned in Port Fernando inlet when White’s ship arrived in a northeastern storm, and his visit was almost aborted then before he stepped ashore. The northeaster had continued and made the failed attempt to return to Croatoan a near disaster for the entire ship. The ship and crew were lucky to survive the trip back to England, and White would never again return to Virginia. White’s report on the 1587 voyage indicates that there were Croatoan on the mainland at Dasamonquepeuk (fig. 1) west of Roanoke Island soon after the colony arrived in 1587.7 White was surprised to find Croatoan rather than Roanoke Indians on the mainland when his men attacked “the Savages our enemies at Dasamongwepeuk [sic]” to revenge the killing of one of the colonists. When John White returned with Manteo and the Lost Colonists the following year,10 he expected to find Sir Richard Grenville’s men who had been left behind. Instead, he learned that two had been murdered and the others missing. Then George Howe, one of the leading colonists, was killed while crabbing some distance from the camp. The unarmored Howe was pierced by 16 arrows and then clubbed to death. White took Manteo to Croatoan Island to ask Manteo’s tribe members for help in assessing the cause of these deaths. He learned that the remnants of Wingina’s Roanoke tribe, probably led by Wanchese, had attacked Grenville’s men and had killed Howe in retaliation for Wingina death. White’s report on the 1587 voyage offers no further information about Dasamonquepeuk and the Croatoan, but Manteo was its “Lord” when White departed. It may be supposed that, with their English allies to support them, the small Croatoan tribe under Manteo was strong enough to retain the mainland against continued attacks by a weakened Roanoke tribe. Maps of the region published between 1672 and 1808 support the contention that the Croatoan continued to occupy the mainland as well as Hatteras Island. The Croatoan Island of White’s 1590 map merged with Hatteras Island when the Chacandepeco inlet closed (fig. 1), and the name “Croatoan” no longer appeared on the Outer Banks. We do not know how much of the mainland was considered Croatoan territory by the Indians, but a 1672 map prepared for use by the Lords Proprietors showed the entire Dare mainland peninsula as Croatoan (fig. 2). John Lawson’s 1709 map (fig. 3) contains the same identification of the Croatoan mainland. Other maps printed after 1590 also show either Croatoan or Croatan on what is now the Dare mainland peninsula. They include Moseley, 1733 (fig. 4) and Mouzon, 1775 (fig. 5). Mouzon identified the eastern part of the peninsula as “Croatan Land” and all the rest was “swamp,” which suggests that the Beechland settlement in the interior was unknown by surveyors as late as 1775. 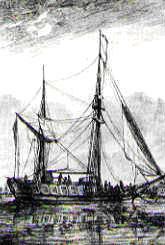 In May 1588, Vicente Gonzalez sailed a small ship from St. Augustine to Chesapeake Bay to find the location of the English colony. He found no evidence of them in Chesapeake Bay, but he accidentally discovered their location on his return when strong northeast winds caused him to row to safety through the inlet at Port Fernando just below Roanoke Island. There he discovered evidence of English settlement. On the inside of the inlet there were signs of a slipway for small vessels. On the land were a number of shallow wells made of English casks and other debris, indicating that a considerable number of people had been there. Assuming that the colonists were still on Roanoke Island, they are very likely to have had an outpost at the major inlets waiting for the return of John White, as well as watching for Spanish ships. Although Gonzalez’s small ship was not a threat, his discovery would surely cause the colonists to expect a larger Spanish fleet to follow and attack their settlement. Unlike the 100 men in Ralph Lane colony, the Lost Colony was not primarily a military force. They were sufficiently supplied with arms to fight off an Indian attack, but they would have been at the mercy of an attack-in-force by the Spanish. The Outer Banks no longer provided cover, and a safer place than Roanoke Island was needed. They were not immediately threatened, but they could not delay too long because the Spanish knew where to find and destroy them. They believed White would not abandon his daughter, friends, and personal effects without making every effort to bring them relief, and he must be told where to find them on his return. White would expect them to relocate 50 miles into the mainland and to leave a sign telling him how to find them without giving their location to the Spanish. Some who had been with the Lane expedition knew the locations of Indian villages, and they would expect that most would be hostile after Lane’s attack on the Roanoke and their confederates. The only support they could count on would be the Croatoan and their confederates. A pinnace (boat propelled by sail or oars) had been left with them, in addition to other smaller boats. These vessels plus Indian canoes could carry all but the heaviest equipment and ordnance to their destination. 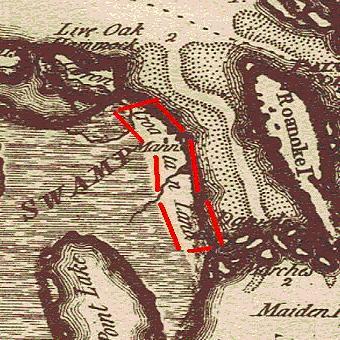 Croatoan Island - Some went to Croatoan Island, which was clearly identified in John White’s 1590 map on the Outer Banks chain south of Roanoke Island (fig. 1). 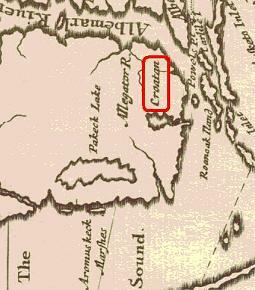 As he stated in his 1593 report to Richard Hakluyt, White intended to learn of the colonists’ destination from Manteo’s tribe on Croatoan Island. White clearly believed that the colonists’ destination would be found there. Some colonists had probably been stationed there to await John White and warn of Spanish ships. Ralph Lane had sent Captain Stafford and 20 men to do just that the previous year.14 However, Croatoan Island was very exposed to any Spanish fleet, and these sandy banks could not feed a large group of colonists. Most of the colonists are more likely to have gone to a safer place with greater safety and potential for feeding the colony. White did not consider that they might be on the mainland because he thought the Roanoke Indians were still there. Lawson’s report would appear to confirm that the colonists were with the Croatoan, that some of the men mated with the Indian women, and that some of the Croatoan (16 fighting men16) still were present in their 1587 villages more than 100 years later. His report that the Croatoan “either lived on Roanak-Island or much frequented it” suggests they roamed freely around the region. Unfortunately, Lawson did not report on the Croatoan’s other “much frequented” territory on the mainland. Quinn referred to Ralph Lane’s report stating that some of his company had wintered with the Chesapeake Indians near Lynhaven. Quinn also refers to Powhatan’s claim that he had killed all the Chesapeake, and all but a few of the white settlers who lived with them, just prior to the Jamestown colony’s arrival in 1607. It seems unlikely that the entire body of colonists could have been so easily defeated, but an advance party might have gone to the Chesapeake and been killed. The visit of some of Lane’s company to the Chesapeake occurred before the Weapemeoc, the Mandoak, and “the Chesapian and their friends” are said to have joined forces with the Roanoke Indians under Pemisapan (Wingina) to attack Lane’s company.19 Quinn admits that no archaeological evidence has been found of white settlers in Chesapeake Indian sites. His theory is not convincing, but it cannot be dismissed before a competing theory is proven by archaeological studies. Quinn developed an interesting scenario about how the colony might have traveled to Chesapeake. He calculates how most of the 117 men, women, and children and their goods and armaments could be moved with only the pinnace and small boats available to them. It is a scenario that would work as well for the movement of the colony by water to the Alligator River villages as to the Chesapeake village. Choanoke - In “Roanoke,” Lee Miller presents the theory that the colonist left Roanoke Island for the Chowan River to settle initially with the Choanoke.20 She agrees with much of the evidence that supports the Quinn and Beechland theories, but she differs with Quinn on a number of the key points that could place them in Chesapeake. By examining all of the evidence collected by the Jamestown colony, she concludes that the colonists had first gone to Choanoke. She then conjectures that many were killed along with the Choanoke, and some were captured by a strong tribe from the west know as the Mandoag (probably the Eno.) According to Miller, the Mandoag took them to the Occaneechi Island “slave trade mart,” which is now under Kerr Lake. From there they were taken to the camps of those who traded for them. 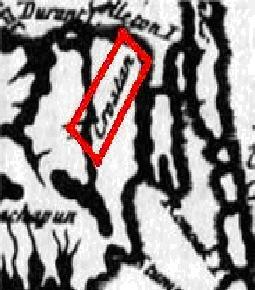 She believes this explains the numerous locations of white men on the so-called “Zuniga Map” obtained from John Smith by Zuniga, the Spanish Ambassador to England.21 She explains the Croatoan signs left for White by guessing that those who went to Croatoan Island were expected to give White the location of the rest of the colonists. She presents an intriguing theory in a well written and referenced book. However, Miller also provides no archaeological evidence of white settlers at Choanoke or any other of the named Indian sites. Willard has found a set of deeds for the Croatoan site he located in 1994 and for Old Indian Town, also on Croatoan Island. He has also discovered a deed signed by Samuel Elks in 1777 selling Buck Ridge. Buck Ridge is possibly the Indian village of Tramaskecoock (fig. 1). Many surface artifacts and a reported Indian graveyard have been found in this targeted Indian village. Following leads from the deeds, Willard located 66 people in Chocowinity, NC with the last name of Elks living within three miles of a targeted Indian village named Panawicky. The Indian village of Panawicky is depicted in the vicinity on over twenty maps. In Chocowinity, there are approximately five hundred people with Croatoan surnames identified in his study. Samuel Elks and his brother Jacob have been identified as being direct ancestors of all of the Elks in Chocowinity. It seems apparent that all of the Elks now living in this small village are direct descendents of the last kings and queens of the Croatoan Indians. Moreover there are over fifty people with the last name of Buck in the same community. Five miles away in Washington there are fifty people with the last name of Squires. The last deeds signed for the Indian reservation lands at Mattamuskeet are by Charles and John Squires, Indian Kings. With the Croatoan apparently located, Willard will now go back to their villages and look for further evidence of the Lost Colony. After further archaeological study at the site on Croatoan Island (Buxton), he will then move to Buck Ridge at Gum Neck at the bend of the Alligator River (fig. 1). He has also agreed to place Beechland and Sandy Ridge, across the Alligator River from Buck Ridge, on the list of sites to be explored. The Hypothesis - Willard and this paper hypothesize that the Croatoan led the Lost Colonists to several Indian sites near the Alligator River, leaving behind a small party on Croatoan Island. The sites include Buck Ridge at the southern bend of the river, Sandy Ridge and other Indian settlements on Milltail Creek, and Beechland. Using the scale of miles on John White’s 1585 map, known Indian sites at either of these locations might meet the criteria of being 50 miles into the mainland from Roanoke Island. It would not be far off using modern maps if they traveled up the Croatan Sound, into the Albemarle Sound, down the Alligator River, and into the Milltail Creek. Figure 6 shows a route “50 miles into the Maine” that the Croatoan and the Lost Colonists might have taken. 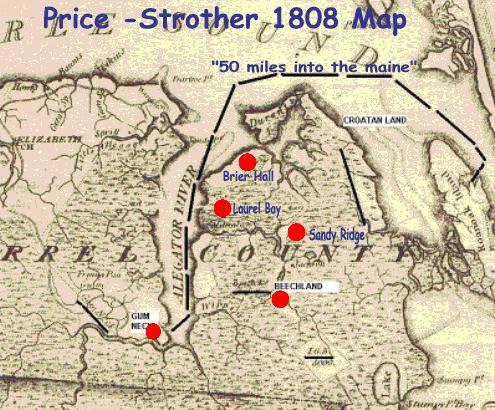 The route is shown on the 1808 Price-Strother map, which was drawn after surveyors for the first time had entered the interior of the Dare mainland (which was still Tyrrell County at that time). Dispelling the “Swamp” Image - Physical evidence of English and Indian settlement on the Dare mainland and Gum Neck seldom shows up on historic maps. Beginning with Moseley’s 1733 map and continuing through the most recent U.S. Geological Service map the interior of the Dare mainland peninsula has been pictured as a “Dismal Swamp” (e.g. Figure 5). It is therefore no surprise that historians such as David Quinn, who are unfamiliar with the peninsula’s interior, have overlooked this potential colonist destination. However, hunters and loggers who had gone deep into the interior of the mainland had seen the sandy ridges that were separated by swampy creek beds. For the Lost Colonists, these ridges may have offered a fertile sanctuary where ample sustenance could be had in its fields, forests, and waterways. 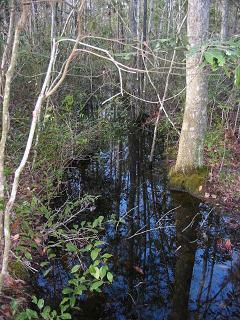 Bogs, swamps, and marshes that surround these productive sandy ridges contribute to the safety of those hiding inside. When the Price-Strothers map (fig. 6) was published in 1808, several interior communities and proposed developments were finally identified. The map in Figure 6 specifically identifies the Milltail Creek and Croatan (formerly Dasamonquepeuk) on the mainland, and it shows Gum Neck (formerly Tramasquecoock) on the opposite side of the Alligator River. Beechland is shown on the map as “Beech L.”, and there is a “Jackson” tract on the opposite side of the Milltail to the northeast. This map was prepared soon after speculators, such as John Gray Blount of Washington, NC, laid claim to thousands of acres between the Croatan, Albemarle, and Pamlico Sounds, including the entire Dare County mainland. Blount’s surveyor reported that a number of settlers were already there, even though there was no record of their having obtained a grant from the Virginia Company, the Lords Proprietors, or the new North Carolina government. The map shows a Blount tract labeled “J.G.B. 5000” at the headwaters of Long Shoal River, where the bombing range is now located. Figure 7, Soil Mapping for Prulean Farms Proposed Farmland Development, identifies the sandy ridges, shallow organic soils, deep peat soils, and marsh/flood kill areas of the Dare peninsula. 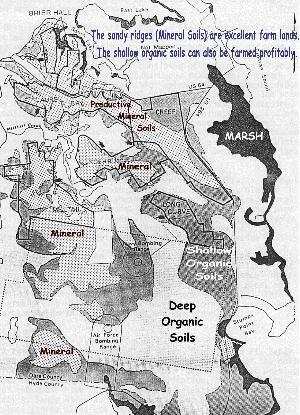 Prulean Farms 1980’s soil surveys determined that 40 percent of the peninsula comprised sandy ridges with dark and histic mineral soils, excellent for row crops. Another 20 percent is shallow organic soils that is marginal for farms but is suitable for forestry. The remaining 40 percent is deep organic soils, marshes, and flood-kill areas. These “swampy areas” are most visible from the peninsula’s waterways and along its highways, leading to the peninsula’s “Dismal” reputation. By the 1980’s, it was even possible to appreciate the potential of one of the sandy ridges from the roadways. About 7,000 acres of the major sandy ridge along Highways #64 and #264 had been cleared and farmed by Prulean Farms. The US Fish and Wildlife Service now owns the land and still farms part of this acreage to provide food for migrant waterfowl. Roads crossing this cleared acreage provide access to the more remote ridges beyond Milltail Creek. 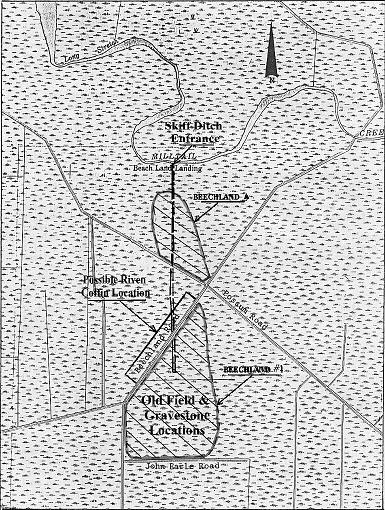 Then in 1982, former students of Dr. Phelps at Carolina Archaeological Services (CAS) conducted a Cultural Resources Reconnaissance of the Prulean Farms project land around Milltail Creek.25 They were guided by Dr. David Phelps’ paper about the Prulean development area that identified Beechland, Sandy Ridge, Laurel Bay, and Brier Hall as having archaeological potential. Descendents of former residents of Sandy Ridge and Beechland accompanied the survey team. Sandy Ridge exhibited material evidence of prehistoric aboriginal occupation, Early Archaic and Middle Archaic occupation (8500 - 1500 BC); but a majority of the undisturbed evidence was of the historic mid-18th to 20th century period farming community. Sandy Ridge contains a historic period cemetery (mid-18th to 20th century) said locally to contain Twiford, Cain, and Sawyer family members. “A few years ago when the West Virginia Pulp and Paper Company was doing some excavating for timbering purposes, they had to dig into a rather large mound near Beechland. In this mound, in the heart of the wilderness, they found numerous Indian artifacts, arrowheads, works of pottery, and potsherds. They also found several riven coffins that were made from solid cypress wood. They were made in a form that can he best described as two canoes—one canoe being the top half of the coffin, and the other the bottom half. “On the top of each of these coffins was plainly and deeply chiseled a Roman or Latin cross, the type that has come to be universally and traditionally accepted as the cross of Christianity. Beneath each cross were the unmistakable letters, I N R I. These are thought to represent the traditional ‘Jesus Nazarenus, Rex Judaeorum’ or, translated, ‘Jesus of Nazareth, King of the Jews,’ the inscription which adorned the cross of Christ at the time of the crucifixion. It was common practice in Elizabethan times to write the letter ‘I’ for the letter ‘J.’ It was simpler and was accepted by the literate people of that day. 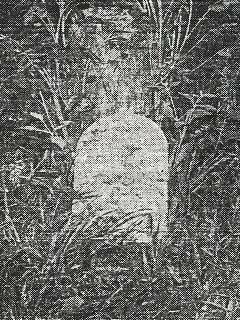 A riven coffin with English carvings buried in the midst of a wilderness in an Indian burial ground—is that coincidence?" Steve Barnes of Prulean Farms and the author visited the site with Mr. Iris Ralph. Mr. Ralph could not place the location exactly but identified a section of about 30 feet along the canal where he was reasonably sure the caskets had been found. The length of the casket taken out of the ditch by Mr. Ralph suggested it had contained a small child. That casket was a hollowed out cypress log with a flat juniper cover. In hollowing out the cypress log, a headrest had been left for the child. Nails rather than pegs attached the cover of this casket. Ralph did not remember if there was a cross carved into the lid, as has been reported by Whedbee. “M. F. Kemp was operating the drag-line near the site of ancient Beechland when he struck a section that had been used as a burial ground. His scoop brought up board-like tree sections, and had moved forward into the site before Mr. Kemp realized what had happened. He stopped the machine as it held a long object which he identified as a coffin. This coffin was almost complete, although the top had been broken by the drag-line. It was about four feet long, and was hand carved from two sections of a log, one serving as the bottom of the coffin and one as the top, these were pegged together. The bottom section was carved so that a wooden ‘pillow’ was provided for the headrest. The coffin was wider at the shoulder section, narrower toward the foot. Upon examination of the other boards or coffin sections, Mr. Kemp decided that five other coffins had been damaged and torn apart by his machine. There were no descriptive marks on the coffins other than the tool marks struck into the wood as the coffins were built. If anything had remained within the coffin it was washed out into the swamp water when the scoop cut through the top section. Mr. Kemp stopped work, and returned to the West Virginia office, where he reported what he had found. James Mann returned with him to the site, and together they investigated the area. The cemetery was a high knoll approximately thirty feet in diameter; it was surrounded by swamp water and marsh at a depth of five feet. The men decided it was a family burial plot, dating from the time of the earliest settlers of Beechland. 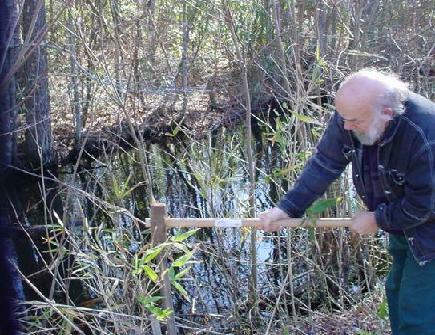 Mr. Mann selected a site on high ground near the canal and the portions of the old coffins were reburied. This remains an intriguing, if somewhat confused, story about the Beechland community. Bill Sharpe - Sharpe got his start as a depression era writer for the Artist and Writers Program of the WPA and later became a highly respected publisher of North Carolina history and geography. In his 1958 New Geography of North Carolina31 Sharpe reported that there was once a thriving community at “Beech-land on Mill Tail Creek.” There, planters cultivated a five thousand acre tract on which corn, a wheat-like grain, and a variety of tobaccos were harvested. Shingles were cut from the forest and a canal dug by slave labor was used to move them to Alligator River from Beechland. Cattle roamed twenty-five thousand acres of reed lands. Sharpe said the settlement disappeared before the Civil War. His sources believed that a cholera epidemic caused its disappearance. “Old people always told me that older people before them said that the Beechland settlement was founded by the English who ran away from Roanoke Island. My grandfather, who came over from Kitty Hawk much later, lived there and married a full-blooded Indian, from Beechland. When I was a boy, there never seemed to be any mystery about this settlement, for the old folks took it for granted that everyone knew it. I use to go up there when I was a boy, and there were still several houses standing in Beechland. Most of the houses were log houses, and some had dirt floors. You reached it by paddling up Milltail Creek about ten miles from Alligator River. Twiford recalled Beechland families with names similar to the colonists, such as Dutton, Sutton, Paynes, Paines, Whites, and Sanderlins. He also remembered families of Sawyers, Edwards, Owens, Basnights, and Ambroses. In the article, Meekins said that he has heard similar stories over the 50 years that he had been a reporter in Dare County. “In the center of this wilderness... there lays a high sandy ridge known as Beechland. Here once lived a large village of people, numbering at one time seventy families, or roughly seven hundred. Here were their homes, farms, and sources of livelihood ... between three hundred and eight hundred people lived at Beechland ... no schools, no church, and little if any ‘hard money.’ Precisely who they were is unknown, but knowledge of how they lived has passed down through generations. “How they arrived in the center of the wilderness is a fascinating problem, equaled by the question. When did Beechland begin? The end of this colony is known, for descendants of the settlers are residents of Dare County today. All had English names, many found at East Lake today. Living with their white neighbors were Indians of the Croatan or Machapungo tribe. Long said the settlers found a grove of beech trees on a sandy ridge near the center of the swamp, approximately eleven feet above sea level, with good drainage into the surrounding swamps. It was near an exceptional juniper swamp bearing giants of the forest comparable to the redwood forests of the West. The land was rich in game; deer and bear were the most prevalent of the large animals, but smaller game such as raccoon, opossum, squirrel, rabbit, muskrat, mink and otters could be found. Wild turkeys were in the trees, and waterfowl and migratory birds crossed the mainland in season. Fish could be taken in the small streams and lakes as well as in the nearby River and Sounds. Oysters, shrimp and clams were close at hand, in Long Shoal Bay. For the lazy hunter there were box, swamp and sea turtles. Basic agriculture gave the families a change in diet from game and fish. From “outside,” came an apple tree and pear tree. Wild berry vines were trained over fences, and swamp shrubs were planted as hedgerows, as in England. Bees filled the sweet gum trees. She told of a hearty breed of men who cut cypress and juniper for shingles and barrel staves. The men would dig a ditch to allow their skiffs to enter the forest and carry out the shingles and staves. They loaded them on their handmade boats and sailed them down Milltail Creek to the Alligator River, then across the Sounds and through the inlets to the Atlantic Ocean. They sailed on to Barbados, the West Indies, and Jamaica where they bartered their shingles and barrel staves, loaded their ships, and sailed homeward to Beechland. In the Caribbean the wood products were exchanged for sugar, salt, flour, coffee, cloth, and anything that would add to a more comfortable life at Beechland. The legendary cause of Beechland’s abandonment was also reported by Long. 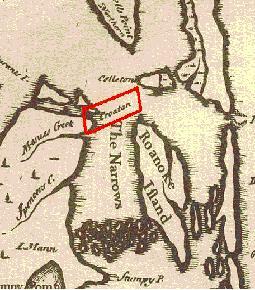 By the 1830’s word of a settlement at Beechland had reached the growing settlement at Manns Harbor, known then as Croatan. Preacher Charles Mann went to Beechland to see for himself the life of the people, their prosperity, and their worldly possessions. He noticed the absence of the Bible, and heard no one speak of the love of God or the salvation of the soul. Also, with no preacher among them, they had undoubtedly not performed their marriage vows in a generally accepted fashion. Preacher Mann warned the people that if they did not turn to the ways of God, the Devil would take them. Some time after his visit, a terrible plague they called the Black Tongue appeared. The people were stricken, and many died. When the Black Tongue plague was over, the settlement was decimated and the people remembered the preacher and his warnings. Settlers began to move away, and by 1850 only Trimmergin Sanderlin’s family remained. Some authors believed Black Tongue to be cholera or the bubonic plague brought from the Bahamas. Barbara Midgette and Fred Willard found an ancient medical dictionary in which anthrax was called Black Tongue.36 Anthrax might well have been in Beechland cattle long before it infected humans. Several of the families moved northward on the mainland, into the neck between East and South Lakes. Some came back to Sandy Ridge, and their descendants remained there until the purchase of the Blount Survey by West Virginia Pulp and Paper Company in 1953. As “outside” life grew closer to those sections, it helped to leave a record of these almost recordless people through their granite and marble grave markers. As the people lived closer to shipping locations they were able to bring in the conveniences of the “outside,” and this included the purchase of grave markers. These mainland residents did not forget the words of the preacher. They built a church of the Disciple doctrine. A few years later the East Lake Methodist Church was built, and in the 1880’s the Kehukee Primitive Baptist Church was founded, with a local man, Manley Twiford, as its first preacher. By fact of possession rather than deed, Beechland was soon inherited by Trimmergin’s son Thomas. He kept his cattle there, numbering several thousand in his herd, to range through five thousand acres. John Gray Blount obtained a patent to the entire peninsula after the American Revolution, but his company never attempted to develop the interior. (He is said to have accumulated a wealth of Continental script from returning soldiers, who thought the script to be of little value, and purchased government land in North Carolina and Tennessee with it.) When John L. Roper laid claim to the Blount Patent after the Civil War, the North Carolina Attorney General had to intercede to secure the property rights of Thomas and his sister Polly Sanderlin. Thomas Sanderlin was the great-grandfather of both Frank Cahoon and R. D. Sawyer, Sr. who were important sources of Mary Wood Long's oral history. Frank Cahoon, former Sheriff of Dare County, was born in East Lake in 1907. He could trace his lineage back to a sister of Malocki Paine who was a son of Henry Paine, one of the blue-eyed, blond-haired Indians of early Beechlands. The word Malocki is probably an Indian corruption of the Old Testament name of Malachi. It is said that both Malocki and his sister were blue-eyed and blond-haired. Other descendants of the original Beechland settlers still live at East Lake, on Roanoke Island, and in the surrounding counties. The names of many are the same as those of the first settlers in the swampland. Much of the evidence of these early woodsmen-sailors was found by lumbermen of the past century. The Beechland Old Field was still evident when West Virginia Pulp and Paper Company (WestVaCo) purchased the peninsula in 1952. They discovered other evidence of Beechland as they constructed drainage ditches for their timber operations. James Mann was Maintenance Director for WestVaCo when Mary Wood Long researched her book. He told her that one could still see the ridges within the Old Field where corn was grown. The hills that once produced potatoes were still formed as clearly as if the farmer of long ago had just departed. The ridges were still evident when the 1982 preliminary archaeological study was made. Many ballast stones of unknown origin have been found in Milltail Creek beds where Nature has placed no stone. The ballast stones must had been brought in to Milltail by the early handmade boats. Bundles of hand-cut shingles have been found, in the peat and in the swamp waters. James Mann has said that, in spite of the fires and hurricane damaged trees; he had seen evidences of juniper and cypress cutting done by the men of Beechland. Soon after John Lawson visited Hatteras, he was brutally killed in the 1711 Tuscarora War. An untold number of the English on the Alligator and Roanoke Island were killed in what we now understand as a second uprising called the Mattamuskeet War. The Indians of this second uprising were never defeated. After that war, it was not healthy for anyone appearing to be an Indian to enter a Colonial town. “Of these great trees (the cypress) the pereaugers or canoes are scooped and made, which sort of vessels are made chiefly to pass over the rivers, creeks and bays, and to transport goods and lumber from one river to another. Some are so large as to carry thirty barrels, though one piece of timber. Others that are split down the bottom and a piece added thereto, will carry eighty or a hundred. Several have gone out of our inlets on to the Ocean and Virginia laden with pork and other produce of the country. Of these trees curious boats for pleasure may be made, and other necessary craft. With such a pioneering independence and the seclusion offered by Beechland, one need not ask if they cleared with the customs inspectors at the Port of Roanoke or Edenton for permits to make the journey, as did “the foolish man of Albemarle and his son.” It is also not surprising that their East Lake descendents became widely known in the 1920’s for the quality of their bootleg whiskey. The evidence suggests that the colony may have first moved to Croatoan villages 50 miles into the mainland. The physical evidence and oral histories suggests that some of the colonists then moved a short distance from the Indian villages to establish their own type of village. One can speculate that the married couples decided to settle separately with their children in Beechland so that they might maintain their English customs. We can only hope that archaeologists will soon make a concerted effort to solve the mystery of Beechland. Even if evidence of the Lost Colony is not uncovered, the research should uncover a wealth of information about subsistence and survival by independent English settlers among the Indians in the earliest days of this nation. David B. and Allison M.Quinn, Ed. The First Colonists: Document on the Planning of the First English Settlements in North America 1584-1590. Raleigh: North Carolina Department of Cultural Resources, Division of Archives and History, 1982. John White to Richard Hakluyt, 4 February 1593 pp.115-116. and David B. Quinn, The Roanoke Voyages Vol. II, New York: Dover Publications. 1955. Hoffman, Paul E., New Light on Vicente Gonzalez’s 1588 Voyage in Search of Raleigh’s English Colonies, Published in The North Carolina Historical Review, NC Division of Archives and History, April 1986. John White’s narrative of the 1587 Virginia voyage pp. 93-106. in Quinn, op.cit. John White’s narrative of the 1590 Virginia voyage pp. 125-126. in Quinn, op.cit.,. John White 1587 op cit pp. 100-102. Ralph Lane’s narrative of the settlement of Roanoke Island, 1585-6. Quinn, op cit, p.41. John White 1587 op cit pp. 103. Lawson, John. A New Voyage to Carolina, 1709. Reprinted Chapel Hill: University of North Carolina Press. 1967. p.69. Quinn, David Beers, Set Fair for Roanoke: Voyages and Colonies, 1584-1606. Chapel Hill London: University of North Carolina Press. 1985. pp. 339-377. Miller, Lee. Roanoke: Solving the Mystery of the Lost Colony, New York: Arcade Publisning, Inc., 2000. 1609 Zuniga Map. The original is in the Archivo General de Simancas, M.P.D., IV-66, XIX-153; reproduced in Barbour, Jamestown, I, facing p. 238. Fred Willard. “Migration Patterns of Coastal N.C. Indians”. Greenville: East Carolina University. undated. p.1. David S. Phelps. Archaeological potential of the Prudential Farms Project Area. Unpublished manuscript, East Carolina University, Greenville NC, 1981. Carolina Archaeological Services, Cultural Resources Reconnaissance for Prulean Farms Joint Venture Proposed Farmlands, Prepared for The Research Triangle Institute: Research Triangle Park NC, 1982. Carolina Archaeological Services, op. cit., pg. 10. Charles Whedbee. Legends of the Outer Banks and Tar Heel Tidewater. “Beechland,” John F. Blair, Publisher: Winston-Salem 1966. p. 31. Victor Meekins, “Colony Was Never Lost, Merged With Settlers, Dare Native Says” News and Observer, Raleigh: July 03, 1960. Nell Wise Wechter, Some Whispers of Our Name, “EAST LAKE”, 1975, pp.. 3-9. Lawson , op cit. p. 103. Cultural Resources Reconnaissance for Prulean Farms Joint Venture Proposed Farmlands, Prepared for The Research Triangle Institute: Research Triangle Park NC, 1982.pp.9-10. “New Light on Vicente Gonzalez’s 1588 Voyage in Search of Raleigh’s English Colonies, Published "The North Carolina Historical Review", Raleigh: NC Division of Archives and History, April 1986. The Lost Colony: An Outdoor Play in Two Acts, Chapel Hill: University of North Carolina Press, 1937. Roanoke: the Abandoned Colony. Savage, Maryland: Rowan & Littlefield Publishers, Inc. 1984. A New Voyage to Carolina, 1709. Reprinted Chapel Hill: University of North Carolina Press, 1967. Environmental Impact Statement for Prulean Farms. Appendix A: A History of the Development of the Albemarle-Pamlico Region with Emphasis on Dare, Hyde, and Tyrrell Counties." Wilmington, NC: US Army Corps of Engineers, 1982. “Colony Was Never Lost, Merged With Settlers, Dare Native Says” News and Observer, Raleigh: July 03, 1960. Roanoke: Solving the Mystery of the Lost Colony, New York: Arcade Publishing, Inc., 2000. Martin’s Hundred. New York: Alfred A. Knopf, 1982. Archaeological potential of the Prudential Farms Project Area. Unpublished manuscript, East Carolina University, Greenville NC, 1981. Set Fair for Roanoke, Chapel Hill and London: University of North Carolina Press, 1985. The Roanoke Voyages: Volumes I and II, New York: Dover Publications. 1991. Quinn, David B. and Allison M., Ed. The First Colonists: Document on the Planning of the First English Settlements in North America 1584-1590. Raleigh: North Carolina Department of Cultural Resources, Division of Archives and History, 1982. A New Geography of North Carolina, Vol. II — 25 Counties. Raleigh, NC: Edwards & Broughton Co., 1958. Legends of the Outer Banks and Tar Heel Tidewater. “Beechland,” Winston-Salem: John F. Blair, Publisher 1966. “Migration Patterns of Coastal N.C. Indians,” Greenville: East Carolina University. undated online publication. www.lost-colony.com. The original is in the Archivo General de Simancas, M.P.D., IV-66, XIX-153; reproduced in Barbour, Jamestown, I, facing p. 238.